There’s that pain scale, numbered one through ten, with increasingly dour expressions on the faces of the metaphorical patient. But the problem is that this scale is based on being healthy with a temporary illness. It’s not properly designed for those who never have a day pass without being in pain. Those of us with chronic illnesses are masters of coping. We learn to smile through the pain and anguish, we conserve what little energy we have by not bothering to cry, and we count out our spoons to figure out how much we can get done in a day. Part of the reason it’s so hard to believe that many of us are truly sick is because of the ways we cope with our pain. It’s more than most people will ever experience, yet we have no choice but to bear it. We only break down when we have the spoons to break down. Even our doctors become lightweight suspicious or reluctant when we come across as cheerful even while our bodies feel like they’re on fire. 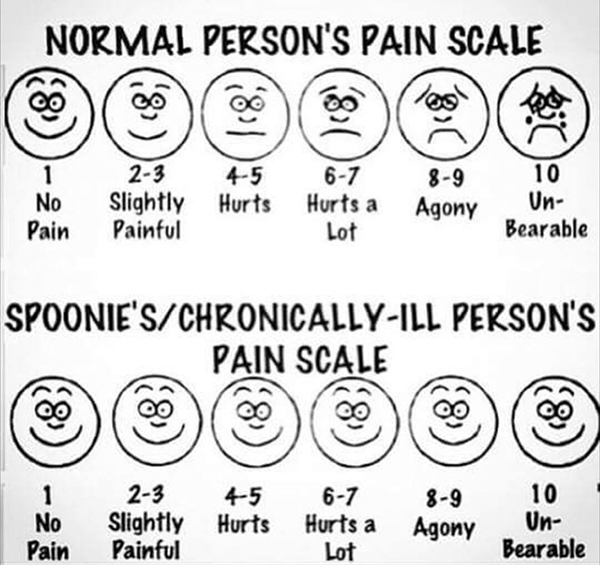 There’s this meme that went around showing an “improved” pain scale for people with fibromyalgia. The face was still smiling all the way up to ten. And that’s the reality. If we make a sour face or actually cry, it means the pain has gone beyond the scale itself. It also fails to account for all the different types of pain we experience. There’s the saying that the Inuit have many names for snow; well, I have a shitload of names for pain. But until there’s a more commonly understood, nuanced key for pain, there will be a disconnect between patients and doctors, loved ones and family. Medications or help that are sorely needed might be passed over because of a misunderstanding about how pain affects people differently. You can provide better care to your loved ones if you can grok that just because they’re smiling doesn’t necessarily mean they feel better. Talks can become quite ineffective without proper language or tools. And right now, treatment based on pain scales is incredibly ineffective.